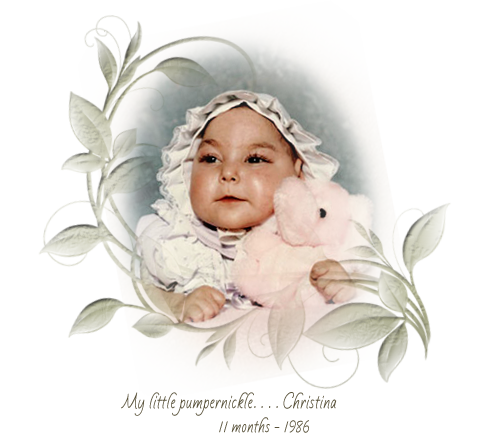 Pumpernickle Doll Clothing was named in honor of my daughter Christina, whom I had referred to as "my little Pumpernickle". In 1985, after my daughter's birth, I searched the stores in hopes of finding something that would fit my daughter's tiny frame, but to no avail. I quickly resorted to sewing itty bitty outfits for my little Pumpernickle, using doll clothing patterns. My little Pumpernickle was diagnosed with several medical conditions, and although she was not expected to live more than a few weeks, the Lord allowed us to be together for just under a year, at which time He brought her home to be with Him. I have since continued to enjoy sewing doll clothing and have been selling the itty bitty wear for 28 years. ...... It seemed fitting to name my doll clothing line in honor of my "little Pumpernickle".